However, many people are referring to this when they talk about pet allergies. To make it easy, whenever the term “allergy” is used in this article it refers to atopy and not to flea allergy or food allergies in cats. This used to be called inhalant allergy. We thought cats were breathing in the things causing allergies. Now it’s known that cats are absorbing allergens through their skin. Humans with allergies tend to sneeze, have itchy eyes, and a runny nose. Cats scratch, but there are things besides allergies that cause itchiness. Your cat can also have more than one thing going on at the same time. Pet allergies are a chronic and progressive disease. You can’t cure it. Most of the time it can be managed well enough with cat allergy medicine to keep your cat reasonably comfortable. Completely eliminating the itch may not be a reasonable goal, but improvement is. The signs of allergies in cats can be different in every cat. There is no set pattern indicating any of the types of pet allergies. The signs can look similar whether the cat is allergic to fleas, food, or environmental things. Usually they are itchy and it can be extreme. They can have extensive sores, chin acne, waxy or infected ears. There may be hair loss and other signs of scratching. Allergies in cats can start at any time, though it’s more common under the age of five. Pet allergies need to be considered for any cat having itchy skin problems. There is no simple test to find out if your cat has allergies. The diagnosis is one of exclusion so you have to rule out all other causes of itchiness first. Food allergies can cause similar problems so you need to check for that. Flea allergy, ringworm, and mites are other possibilities. The list doesn’t end there either. Remember, there can also be more than one thing going on at the same time as well. Allergy testing is done with either skin tests or a blood test. However, you can’t diagnose allergies by these tests because normal cats can also have reactions on the tests. Allergy testing is done only if you are going to do immunotherapy (allergy shots like people get). It’s used to decide which allergens (the things causing allergies) to put into the cat allergy medicine treatment set. 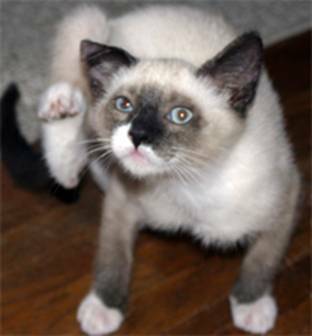 The first goal of treatment for allergies in cats is to control the itchiness. This will make your cat more comfortable, prevent damage to the skin, and will help you feel better. Avoidance of what is causing the allergies is usually not practical. The allergens are common in the environment and there are usually several allergens causing problems for your cat. Since dust is a common cause, use a dust-free litter and wash bedding weekly. Vacuum 2-4 times a week and change or clean the bag frequently. A HEPA air filter may help as well. If your cat will tolerate bathing, giving a bath once a week will help to remove dust and pollen from her coat. Use a shampoo to help with itchiness and use something to moisturize her skin. Allergens are absorbed easier through dry skin. A good diet and fatty aqcid supplements will make the skin healthier and make it more difficult for allergens to be absorbed. Fish oil can improve the skin and has anti-inflammatory effects. However, it can take a couple months to see improvement so don’t give up too quickly. Antihistamines will help a small number of cats. It tends to be more effective if given along with fish oil. You can give cats 2 mg chlorpheniramine twice a day. Antihistamines can cause drowsiness. They are also bitter and some cats will salivate if they bite into them. Always consult your vet before giving any medications to your cat. Cyclosporine (Atopica®) suppresses the immune response. 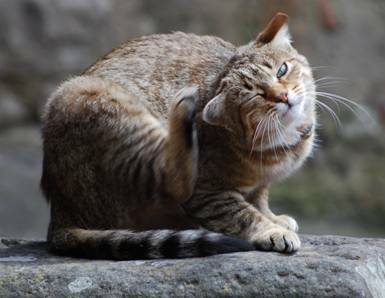 This effect will help some allergic cats be less itchy. Cyclosporine can cause vomiting or diarrhea. Starting at a lower dose and using liquid may help to prevent those side effects. If your cat has toxoplasmosis, it can cause that disease to flare up. Steroids (cortisone) generally work very well to control itchiness. Unfortunately, they can have serious side effects involving the internal organs and should be used as little as possible. The only way to improve allergies in cats long-term is for the immune system to stop reacting so strongly to allergens. This is done by hyposensitization or immunotherapy. This means you give very small amounts of the allergen to your cat over a long period. This is to help his body “get used to it” so it doesn’t trigger allergies. This is what “allergy shots” are that people get. It can be given by injection to cats or in a liquid under their tongue. Unfortunately, this is only effective about 60% of the time and it may take many months before you see improvement. However, it may be worth trying. When it is effective, it can make a significant difference. If you need more information on giving your cat allergy medicine, check out this article.